A leisurely lunch with new friends in Poitiers, France. All photos courtesy of G&T Weekends. A long weekend in a jaw-dropping French castle or a dreamy Spanish villa is more attainable than you think. Throw in a bunch of insta-friends and you’re bound to have a memorable trip. We chatted with Gillian Scatliff and Tess Stokes, co-founders behind G&T Weekends, a travel company offering luxury getaways in countryside mansions, villas, chateaus, and palaces around Europe and the United States. Tell us about G&T Weekends. Gillian: Tess and I organized my going away weekend party from the UK at an incredible manor house in the English countryside. We loved having a property we could take over and party in and decided the easiest way to go about it was to have everyone pay a set price that covered transportation to and from London along with food and drinks for the weekend. We hired caterers for the event; ordered enough beer, wine, champagne, and liquor to equip an army; and scheduled clay pigeon shooting and country walks. Our friends loved that they could just show up, relax, and have an amazing time without the hassle of scheduling the trip on their own. Tess: We had such a ball planning the long weekend, we decided to keep going. We started organizing all-inclusive weekends (transport to and from the airport, chef-prepared meals, wine, beer, cocktails, even the obscenely luxurious room) in various castles, palaces, luxe lodges, and chateaus all over the world. No one else was offering the same experience. We thought there was a market for cool 20-to-30-somethings looking to travel and let their hair down a bit, who would want someone else to take care of the details. Do either of you have a background in travel planning? Tess: My dad ran party cruises in Brisbane, where I’m from, which I worked on as a teenager. I also have traveled extensively, with and without my family, planning trips like the one Gillian and I met on – kayaking and hiking in the Norwegian Fjords. Gilian: When I went backpacking around South East Asia for a few months, I planned for ages in advance and had a formidable Excel spreadsheet with every bus, train, flight, hotel, you name it, with timings meticulously planned. I completely understand that this level of neuroses is not for everyone, but I truly believe it allows for more spontaneity while away. I had more time to relax and try new things while fellow travelers would spend hours holed away each week trying to figure out bus times or available hostels. I also lived in London and worked in fashion, which was a great foundation. If you can keep a million moving parts and absolute chaos organized during Paris Fashion Week, you can plan anything. What type of people most enjoy your trips? Gillian: Singles looking to meet someone like-minded, or anyone who wants to meet some cool new friends. Lots of people who come on our trips are from major cities like London or New York City and tend to be between the ages of 25 and 40, so they end up meeting friends and lovers from their cities who they continue hanging out with even after the trip is over. Tess: Couples who want a mix of a romantic holiday – because our trips are pretty dreamy (we love a good champagne toast during a breathtaking sunset on a yacht cruise) with a fun party element, so things don’t get boring. Happy hour in the Sahara Desert. What does a typical day with G&T Weekends look like? Tess: An al fresco breakfast on the lawn of your mansion overlooking the rolling hills/beach/ocean, while laughing about last night’s antics with new friends. Go quad biking/enjoy a private cooking class/go horseback riding before going back to a decadent abode for a glorious long-table lunch cooked by a local, award-winning chef. There’s plenty of rosé to go around. (Did we mention that all meals and all drinks are included? I can’t stand bad wine, so we always have the good stuff!) No opening of the wallet makes for a very relaxing trip. After lunch, change into swimsuits and take a sunset cruise onboard a private yacht. 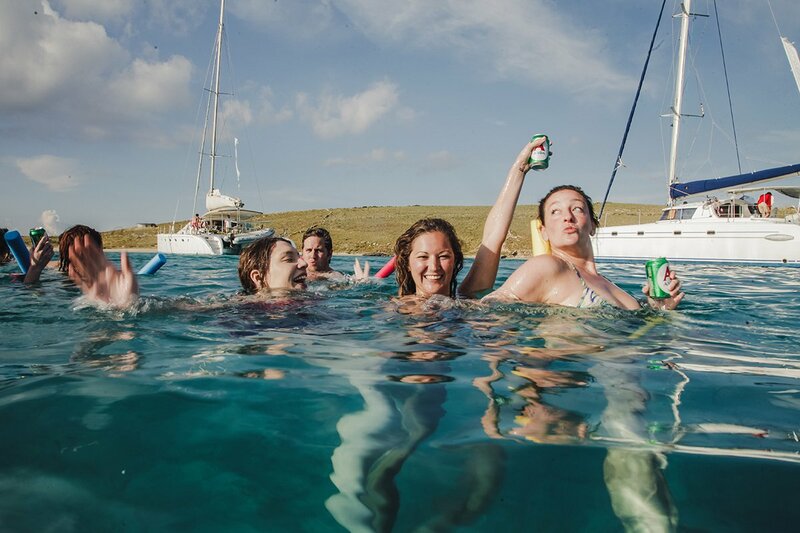 Snorkel, swim, or float with a cold beer in hand in the salt water. Enjoy a seafood dinner while taking in the beautiful sunset. Upon return to the house, dance while a DJ spins and cocktails are poured by a handsome bartender. Sample the local nightlife (Mykonos, you did not disappoint), or dance the night away in the ballroom of the incredible property you're staying at. Is there a single trip that stands out as the most memorable? Gillian: This is such a difficult question to answer. People always ask my favorite, and truthfully I don’t have one. They are all different but equally incredible. That said, Iceland is very special to me. It is such a quirky place with the most beautiful and unique landscape. 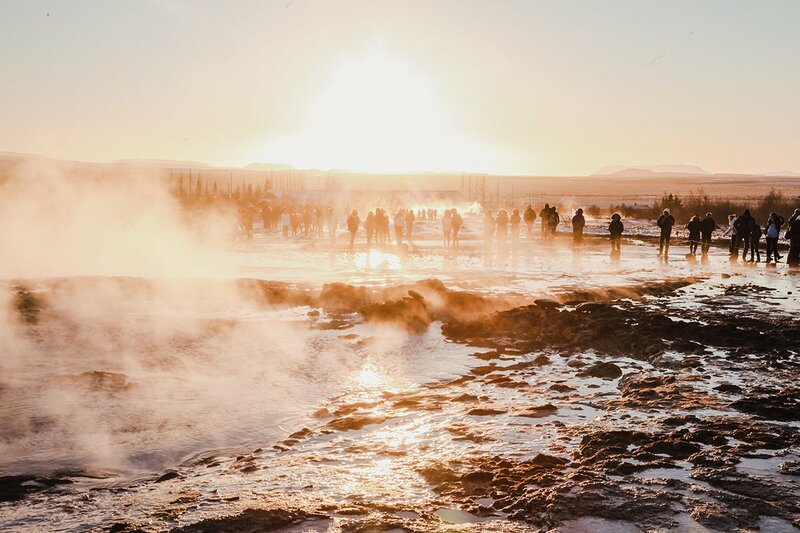 The variety of things to do – from dog-sledding and ice-caving to experiencing the amazing culture and live music scene – makes it the most fascinating place. I can’t get enough, and neither can our revelers. Our New Year’s trips to Iceland always sell outs immediately. We will be launching more for 2018 and 2019 very soon. Gillian: We’re led by destinations that we think are on the brink of becoming popular and the amazing property we can find in those places. Tess and I still travel extensively on our own, so we also like to explore opportunities while we travel. Tess: It's really fantastic when we already have an understanding of the property and a good relationship with the owner. We’ve also been led down some pretty crazy internet wormholes trying to find new properties. Are there places you would never return to? Tess: Properties that are difficult to deal with or disorganized. Thankfully, those are few and far between. We’re really lucky to work with incredible properties and make brilliant relationships with the owners and managers. We like to work with fantastic people who understand what we’re doing. So you get a bunch of strangers together in a foreign place. Some crazy things must happen. Tell us about a total disaster. Gillian: Nothing that I would admit to in print! All jokes aside, we have been very fortunate to not have anything truly disastrous happen. Tess and I are both pretty resourceful and have yet to have anything noticed by our guests. I bring a full vial of with me on trips, though … the funniest thing that has been documented would have to be Tess’s little sister’s epic fall into the fountain at our Easter weekend in a French Castle a few years ago. It was captured via drone footage, which you may have seen since ! She will be acting as our event coordinator for our trip to France this May – I’m not letting her near any drones or pools. Now tell us something amazing about getting a bunch of strangers together. Tess: There have certainly been no shortage of pinch-me moments on our trips. My favorite night is always the last. A group of 20-30 people at the beginning of a trip seems vast, but by the last night, it feels like a small family. The final dinner is always the most intimate, candlelit, and with the familiarity of old friends and the laughter of a very good time. I love catching our guests in moments that are taking their breath away – maybe riding by dogsled into the sunrise, watching the sunset over the dunes outside a Berber tent (I’ve got a real thing for sunsets), or cinematic party moments. I’ll never forget one of our first weekends at a 17th-century palace in Tuscany. We had a Godfather-themed party on the last night, and there was a moment when the music really swelled and I looked up to 35 people dancing wildly in black tie on the steps of the lit-up palace. It looked identical to that scene in The Great Gatsby – you know the one. Our biggest pride is the relationships – romantic or friendly – that have come away from our trips. We’ve had couples date, get engaged, and many people who have made life-long friends. That is the most amazing part. Cold beers and swimming in Mykonos. Any tips for traveling with large groups? Gillian: Pre-organize as much as you can, while allowing for some flexibility. I’m going to Japan with ten people this month and we’ve made some reservations for dinner, as is necessary for most big cities (particularly Tokyo), and some activities. However, we haven’t planned every minute, which will allow people to branch off and do their own thing. If you like your alone time (I’m right there with you), I recommend planning a few things alone. As much as I love spending time with friends and meeting new people, I will often book a few things on my own to decompress a bit, like going to an exhibit alone or taking my laptop or book to work or read in a cafe. Nobody wants to be around an irritable person on holiday. Try to plan things where you are paying in advance or have set menus at restaurants. Sometimes splitting the bill for large amounts of people or chasing someone for payment can be incredibly awkward. And my advice for traveling always is to go with the flow! Do not freak out and ruin your trip because something unexpected has come up. Embrace it. Take a breath, have a laugh, go get a cocktail, and use your resourcefulness to figure something out. This is particularly important when traveling in a group. I have had countless flights canceled, been locked out of Airbnbs by the owner, had my luggage lost multiple times, been scammed, and the list goes on. I refuse to get worked-up or let those things dampen my spirits. You want to look back on your trip and remember the glorious moments, not the times you lost your cool. What destination do you dream about? Tess: Sri Lanka has been high on my list for years. I think our revelers would love the outdoor activities (jungle trekking, waterfall-chasing, and whitewater rafting) and diverse landscapes. I think we could provide a once-in-a-lifetime trip for our guests in a stunning setting. Where is G&T Weekends heading next? Gillian: Our next trip is at a jaw-dropping ; from September 14-17, 2018, we are heading to ; and we’ll be spending New Year’s in Iceland. On March 2, 2018, we’ll be launching our first trips within the United States at a . We hope you’ll join us. 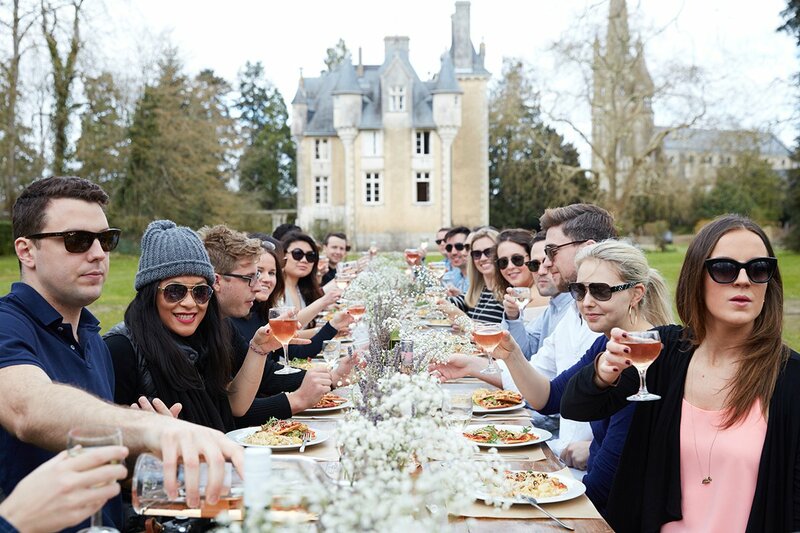 Gillian and Tess are the co-founders of , a company that hosts long-weekend group trips in luxe mansions, villas, and chateaus all over the world. You can follow them on and . They travel for the opportunity to drink rose floating alongside a yacht in the ocean and the unexpected surprises you can only find by getting out and exploring the world. У нашей фирмы авторитетный сайт с информацией про Купить диплом.